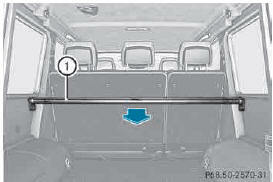 The cargo compartment cover is located behind the rear bench seat backrest. : pull cargo compartment cover 1 back and clip it into the retainers on the left and right of the rear door. : unclip cargo compartment cover 1 and guide it forwards until it is completely rolled up. : make sure that cargo compartment cover 2 is rolled up. 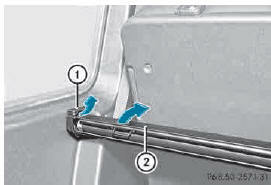 ► Slide catches 1 on the left-hand and righthand sides of cargo compartment cover 2 towards the center of the vehicle. ► Swing cargo compartment cover 2 up and out. : slide catches 1 towards the center of the vehicle. ► Insert cargo compartment cover 2 into the recesses in the side trim. ► Push down the right-hand and left-hand sides of cargo compartment cover 2 until it engages. ► Slide catches 1 in the direction of the side trim.